The Bible is both the inspired word of God for his people, whether in biblical times or for the church today, and a fully human book, written in a variety of cultural settings. The Apollos Old Testament Commentary aims to take with equal seriousness the divine and human aspects of Scripture. 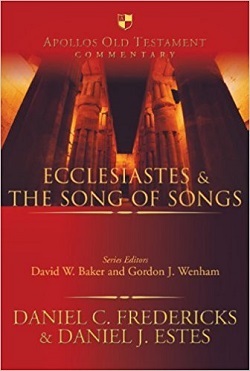 This volume by Daniel J. Estes and Daniel C. Fredericks expounds the books of Ecclesiastes and Song of Songs in a scholarly manner, and it shows the relevance of these important books to today's readers. Edited by David W. Baker and Gordon J. Wenham, these commentaries are intended primarily to serve the needs of those who preach from the Old Testament, but is equally suitable for use by scholars and all serious students of the Bible.